Some time ago I thought it should be possible to reproduce an irregular shape in some kind of automated way. I did some research and found various devices to copy odd shaped non-symmetrical objects. There are a stack of things like rifle butts, that are of course mass produced, so in hindsight it was obvious that it could be done, and must have been done for years before sophisticated computer controlled devices could cut 3D shapes out of raw material. f. original lure glued to shaft. when the hand crank(d) is slowly cranked, all 3 shafts (a,b,c) rotate because they are connected by the pulley belt (e). as the center shaft (b) rotates, the migration nuts migrate along its length taking the copy reader wheel (i) and angle grinder (h) also along the length of the shaft. As the threaded migration shaft rotates, it moves the migration nuts, angle grinder, and reader wheel asembly because the nuts do not rotate with the shaft. Rotate the shaft when keeping the nuts from rotating and they are forced to move along the length of the shaft. As the original lure (f) rotates it forces the center assembly (h,i,j) to rock back and forth. 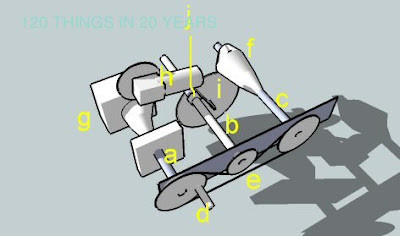 when the reader wheel "reads" a high point on the original, it rocks the assembly so that the angle grinder imparts the same high point on the copy (g). The copy reader wheel would read the highs and lows and in betweens in the same manner. In this manner it should be possible to create an exact copy of any irregular shape, or in my case a not so hand made fishing lure, simply by turning the handle. I make no claim to inventing this, although the migrating assembly may be an original idea. If it is I give it freely to the world. If it isn't, oops sorry! This design was inspired by everything I found in my research, and is a combination of stacks of different approaches.